The newspaper called the cartoon a "journalistic piece". 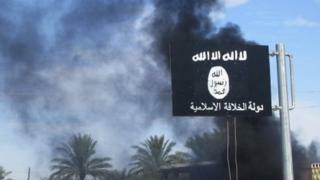 IS, also known as Isis, is a militant Islamist group fighting a brutal campaign in Syria and Iraq. Published on 3 July, the cartoon replaces the oval shape on the original flag with a skull and crossbones but leaves the Arabic religious phrase "Laa ilaaha illallaah", meaning "there is no God but Allah". It also shows the words Allah and Muhammad, which are sacred to Muslims and found on IS flags, inside the skull shape. The Post, a leading English-language daily, said the cartoon was meant as a critique of the use of religious symbols in acts of violence. But some Muslim groups said the cartoon was offensive towards Islam. The Post apologised and retracted the cartoon on 8 July, saying it regretted the "error in judgement". On Thursday, police named the Jakarta Post's editor-in-chief, Meidyatama Suryodiningrat, a suspect for religious defamation. "We are amazed because the fact is we did not commit a criminal act as accused," the newspaper responded in a statement on Thursday. "What we produced was a journalistic piece that criticised the Isis movement, which has carried out violence in the name of religion. It means that the Isis caricature was not blasphemous." Rights group Amnesty International has condemned the move by police. In a statement the group said the incident went against President Joko Widodo's commitment to press freedom in Indonesia. A police spokesman told the BBC Mr Suryodiningrat could be summoned next week. He could be facing five years in prison for religious blasphemy.